The military and social capital of Alta California during Spanish and Mexican rule, the town of Monterey naturally became the county seat when the 27 original counties were formed in 1850. But when it was learned that the railroad was to go through the valley and not along the coast, the government center was moved to Salinas. After the house used as a courthouse burned, this much larger brick Victorian building was commissioned. 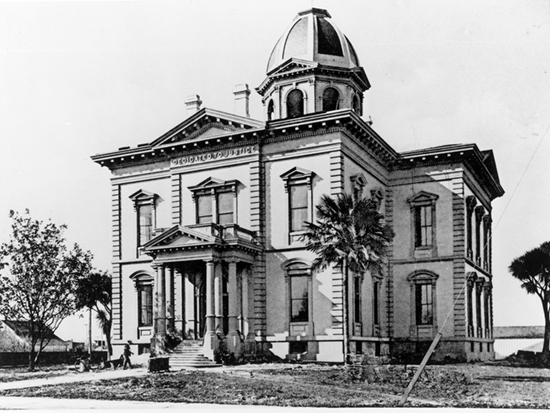 The courthouse remained in use while the current one was being constructed around it, and then was demolished. Today, a courtyard, lily pond, and commemorative sculpture occupy the site.